Supporting up to 2500 lbs. total, this heavy-duty Husky Tool Chest and Cabinet is great for storing and organizing all your tools and hardware. The chest is made from high-grade, all-welded steel construction and finished with tough, industrial textured black powder-coat paint. Fifteen drawers and an easily accessible top till provide an impressive total storage capacity of 35,767 cu. inch Drawers are all full-extension and glide effortlessly on ball bearing slides that can support up to 120 lbs. Also inside the lid are four electrical outlets and two USB ports that allow you to securely charge tools and portable devices while unit is locked. An ergonomic handle and 5-inch x 2-inch casters allow you to easily move the cabinet around your workspace, and there's even a bottle opener attached to the side of the cabinet to pop the top on a cold beverage. Both the chest and cabinet have an internal keyed locking system with two keys provided for added security. 27-inch W 6-Drawer Tool Cabinet This black 6-Drawer tool cabinet is easy to roll and lets you take your tools and supplies right to the job. Rugged all welded steel construction is protected by a tough industrial powder coat paint finish. All drawers feature 50 lb. rated ball bearing drawer slides. Deep bottom drawer features two sets of slides that allow you store large heavy tools. All drawers have extra-large full width aluminum drawer pulls for easy access. Heavy Duty 5 in. x 2 in. casters rolls easily under heavy loads. Two swivel casters have brakes to keep the cabinet in place. All casters are easily mountable. Simply turn the cabinet on its top and insert bolts through the caster plate into pre-welded nuts and then just tighten down. Each mobile cabinet is further supported with a reinforced base which offers added strength for heavier loads. An ergonomic tubular side handle is designed to comfortably fit your hands for easy pushing of cabinet. The cabinet drawers are secured by a keyed internal locking system and come with 2 keys. 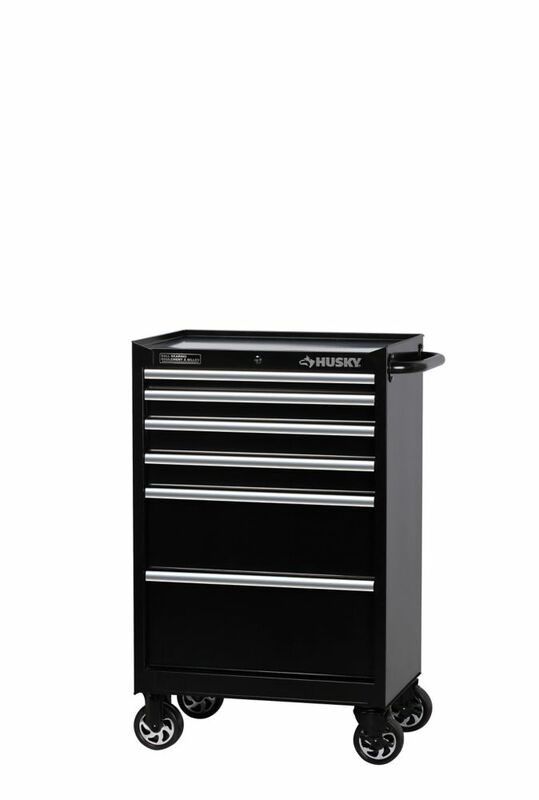 27-inch W 6-Drawer Tool Cabinet is rated 5.0 out of 5 by 1. Rated 5 out of 5 by Graham from Great purchase I was looking for a tool chest and I happened upon this one. It was exaxtly what i was looking for, it assembles easily and drawers slide open and closed with ease. Great value for your money.